Come for weird news, stay for the lesson in cattle terminology. Australia’s Knickers the steer has roused moderate internet fame. The Holstein Friesian got a stay of execution for being too big for the slaughterhouse. 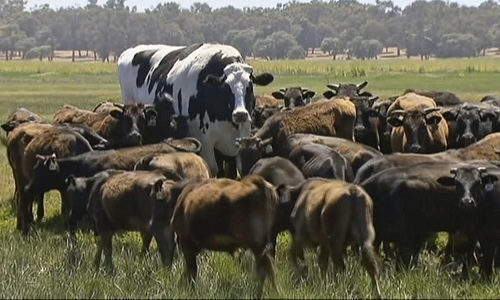 The 6-foot 4-inch steer weighs 1.4 tons. That comes to right under 3 thousand pounds. The 7-year-old steer will be living out his life with his owner, Geoff Pearson, in Lake Preston southwest of Perth. People claim the news to be misleading of Mr. Knickers here, so let’s clear up a few things. First of all, Knickers isn’t technically a cow. He’s a steer. The difference in the gender, for the most part. Female cattle are cows, or heifers after they’ve bred. A castrated male like Knickers is a steer, while uncastrated males would are bulls. That accounts for some of the size difference in pictures, but not all of it. The other trick is that Knickers is a Holstein Friesian, a different breed of cattle than the ones he’s pictured with. Often Knickers will be with a herd of Wagyu cattle, which are a smaller breed, making Knickers appear even larger than he is. The wagyu are also likely to be all cows, not steers. Come for weird news, stay for the lesson in cattle terminology. That doesn’t mean Knickers isn’t huge. 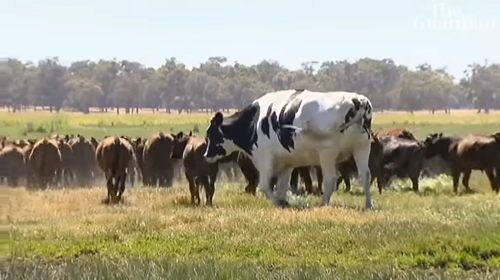 This dude stands two feet higher than the average Holstein male and nearly twice as much. You could definitely pick Knickers out of a crowd of his peers, but it wouldn’t look quite as impressive as pictures provided. Not going to the slaughterhouse as well as having been castrated means that Knickers could spell a loss of profits for Pearson. If Knickers isn’t made into beef and can’t breed, then all he’s really going to do is eat. Previous PostPrevious Can You Hang and Hold Yourself for Just Under Two And A Half Minutes?